My Irish friend said, spoon in one hand, plate piled high with rice, rasam and pickle in the other. The first taste of Indian pickle to the unaccustomed palate must be akin to the initial experience of India to the first time visitor. A little too much of everything, all at once. Pungent. Industrial. A cacophony of noise, each note seemingly competing with the other. Car horns and auto-rickshaw toots. The cries of hawkers, beggars and babies. Bollywood music and giggling school girls. Smells……the hunger inducing ones like fresh pakoras fried at a roadside stand mingling with that of diesel fumes from passing trucks and dung from more slowly passing cows. Dust clinging to skin with the cloying humidity. The sun’s unrelenting blaze reflected from every metallic surface. It is the saltiness that registers first, which goes some way to balance the tartness that follows. 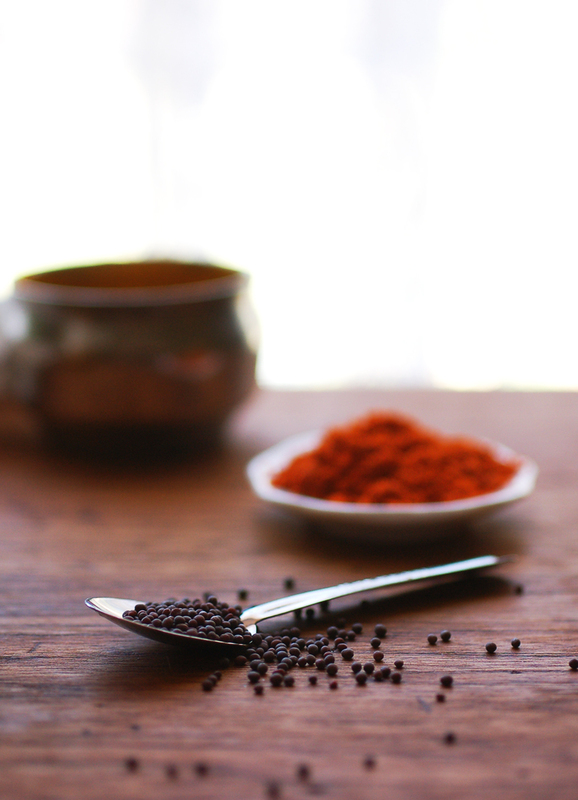 The spices sing their soprano notes and for a moment the tongue is seized up with the too muchness of it all. A soft, yielding flesh made so by its’ weeks to months of steeping in acidic juices. The liquid gold gravy with its’ many-layered flavours coats the tongue and finally electrifies the back of the throat with a flash of heat. An assault to the senses and chaos to a first-timer, but one where everything, somehow, just works. 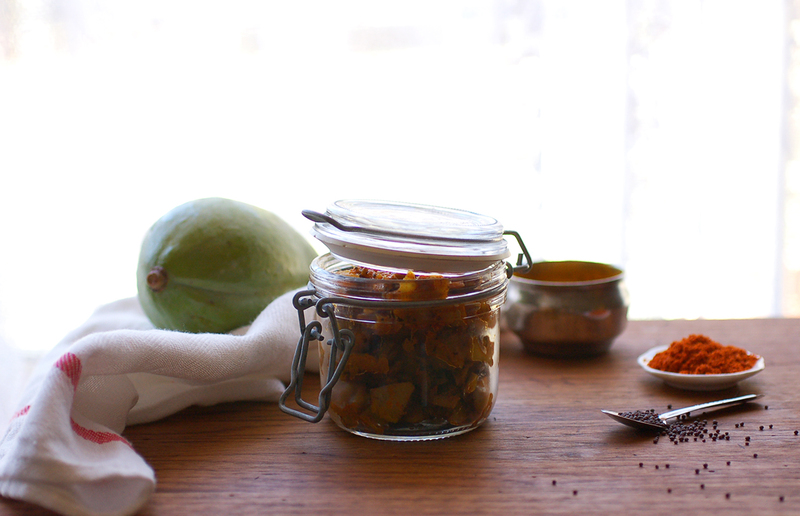 This is a cheat’s mango pickle, but one that delivers all of the palate stimulation that properly pickled pickles do. A chop and stir fry later, you have in your hands a spicy, sour condiment that can be eaten traditionally with rice, spread onto a sandwich or relished however you please. In a large, non-stick fry pan, heat the oil. Add the mustard seeds and reduce the heat to low. Once they have popped, add all the other spices except for the salt. Stir gently and fry on low heat for about 1 to 2 mins. Add the diced mangoes, then 2 tsp salt and toss to coat the mango pieces in the spices. Cook on medium heat for 1 minute. Taste and add a little more salt if the pickle is still very tart. Toss and cook for another few seconds or until the mango pieces are tender, but not falling apart. 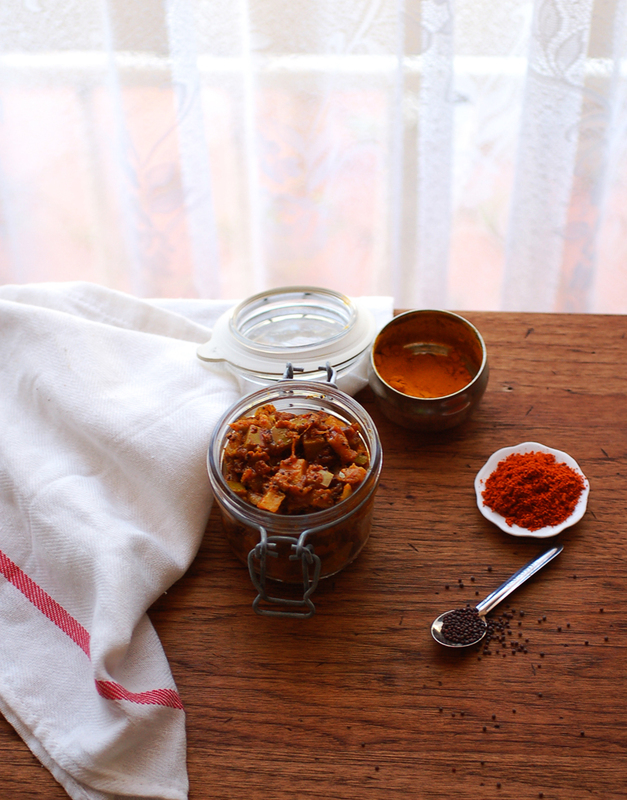 Store in clean, dry, airtight jars and refrigerate for up to a month. 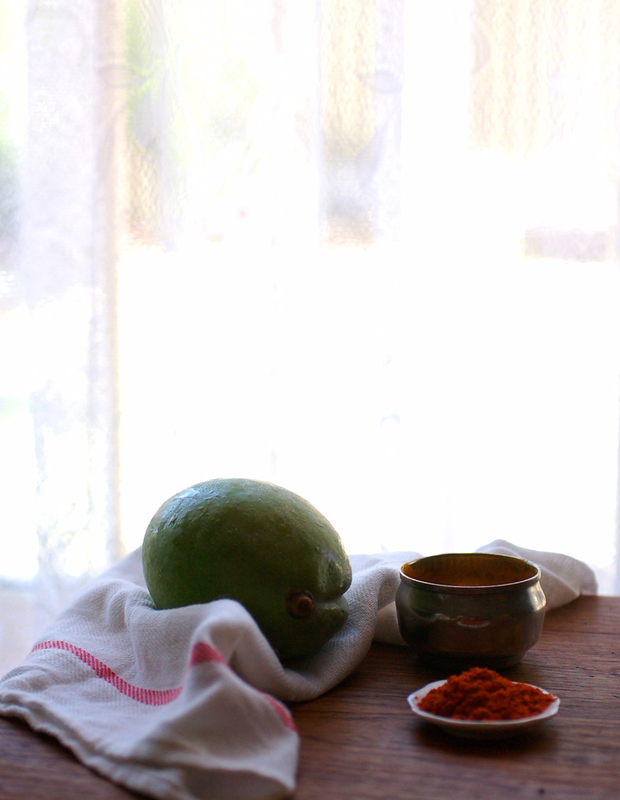 Raw green mangoes and the spices, including rasam mix are available at Indian grocers. The more green and tart the mangoes are, the better. You could probably use coconut oil if you wish, but that will impart its own flavour to the pickle. ← Rose and Raspberry Celebration Tart for OSP’s 1st Blogiversary! I love a ‘cheat’ anything, especially when it comes to condiments. Your description has me salivating and wanting to whip this up at home. i was given a few green mangoes, now i know what to do with them! This looks delicious! I’m going to have to go on a hunt for some green mangoes. Thanks Brier. Yes you must try it if you find the mangoes!